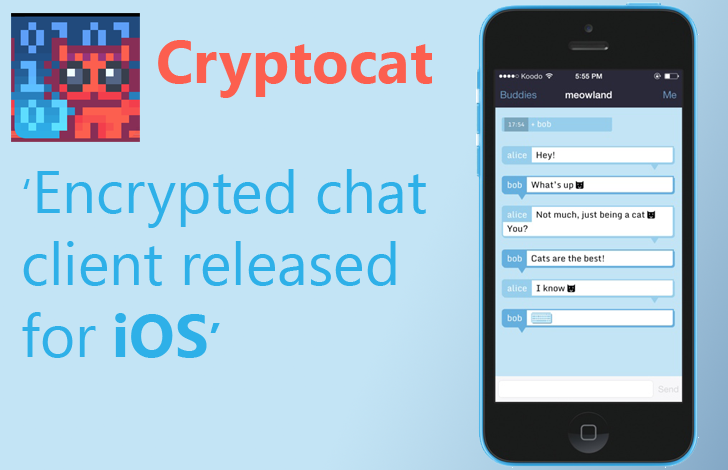 Cryptocat, an open source encrypted web-based chat client, is now available for iOS Devices from the Apple's App store, which was initially rejected by the Apple last December. It is not clear why it was rejected previously, but the good news is that, now 'Cryptocat' is available for all iOS Devices. So far Cryptocat was only available for Linux and Mac OS X, and as an extension for web browsers Mozilla Firefox, Google Chrome 3, Apple Safari and Opera. Cryptocat has become quite popular in the wake of the NSA Controversy, because of its end-to-end encryption that doesn’t allow anyone in the middle to read your messages. Cryptocat for iPhone uses the OTR protocol for private conversations, a cryptographic protocol for secure instant messaging, and perfect forward secrecy, a system that constantly generates new user keys. So, snoops cannot decrypt older messages. It doesn't require any username or account rather just one time nickname makes the conversion possible and everything is lost after the conversation has been finished. Cryptocat Servers are held in a Cold War Nuclear bunker in Sweden to protect them from government intrusion. In a demo at RightsCon Silicon Valley, Cryptocat unveiled its first mobile app and also answered various questions from Technologists and Civil society members. "After a year of collaborative development, testing and tweaking, we’re finally ready to bring the world’s most privacy-loving cat to your pocket!" developer said. Over the past two years, cryptocat has made encrypted chat fun for journalists, coworkers, teachers, activists, Hackers etc. "Easily have group conversations with your friends without fearing monitoring or interception. Cryptocat is free, open chat that aims to provide an open, accessible Instant Messaging environment with a transparent layer of encryption that's easy to use." developer said. Cryptocat is working on an app interface to make it user-friendly and is providing a more secure platform to their users. Its source code is available on Github, so that security researchers can review prior to any official release. Also check TextSecure, another end-to-end encrypted and open source messaging app for secret chats. Cryptocat for Android is also coming soon! Stay Tuned!